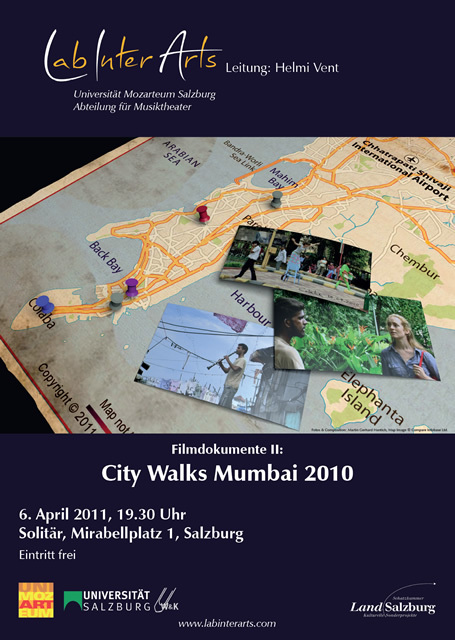 The film documentary City Walks Mumbai 2010 provides insights into a three-week project in Mumbai. From initial orientations of the project participants at public places in the Indian metropolis through gradual attempts to come into contact with people via the participants’ own learned artistic languages, the camera observes the process with all its overtures, actions, conversations and reflections. The unknown converges with the coincidental, the understood with the incomprehensible. Gears are discovered that are capable of setting things in motion but can also get stuck and slow things down. Again and again, it is the "other", that which is so very unfamiliar, that raise questions in the daily attempts to work as an ensemble and causes the participants to perceive and reflect on what they thought they knew in new and different ways. The AV documentary ensures the sustainability of the interculturally oriented project work in the ongoing research processes of Lab Inter Arts; in addition, the film documentary is intended to make the central concern of the laboratory work, namely the mobilization of communicative and social resources between art and culture in direct confrontation, discussable. Film duration: 42 minutes, followed by a discussion.